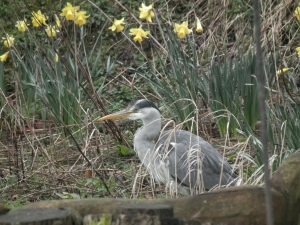 We posted previously that a Heron has been visiting our wildlife garden pool and this morning I was sat working at the table when he returned and took up fishing position at the shallow end. He/she kindly posed for a photograph and remained quite unconcerned at my proximity until a frog had been caught and consumed. When disturbed, the Heron flies up the field next to the garden and lands just behind a grassy knoll where only his head is visible and awaits a safe return. Most of the frogs that were attracted to the pond for spawning have now dispersed into the surrounding environment, so I am confident that the local population can survive this temporary predation.